I got my old Pulsar 1 and 2 up and running again with SCOPE v7. Pretty impressive that these 20 year old cards still work. I've tried getting MIDI to work from Ableton and can't seem to find a way to have the MIDI routed to Sequencer Out on the SCOPE platform. I'm using Ableton and use an External Instrument but I think I need to configure the Control Surfaces of live somehow and I don't know how to. Any tips on getting this to work? What i do is this; in Live, make sure midi is set up correctly. Below is a picture of my setup. Thanks for the answer with a screen shot! I see the problem is that I don't have "Scope PCI MIDI 1". Do I need to install something separately in order for that to show up? no, you need to make sure there is a sequencer midi source and destination in your Scope project before you open the sequencer. you must close the sequencer if you change the sequencer midi modules, or if you change the type of ASIO i/o, or the number of ASIO i/o. once those things are in place, you can open the sequencer. you can connect to or disconnect from those modules as you please, but to change them you need to shut the sequencer down. As you enjoy getting answers as a screenshot, let me add these pictures. uncheck "reset board if idle". this prevents the computer from deciding that you aren't using the card and disconnecting power from it(which leads to "copy protection" errors that can't be fixed except by rebooting. I don't know if I'm doing something wrong, but I still don't see the scope midi in Ableton. I'm running the Scope software as Admin and also tried that with Ableton. I'm running Windows 10 64 bit if that matters. 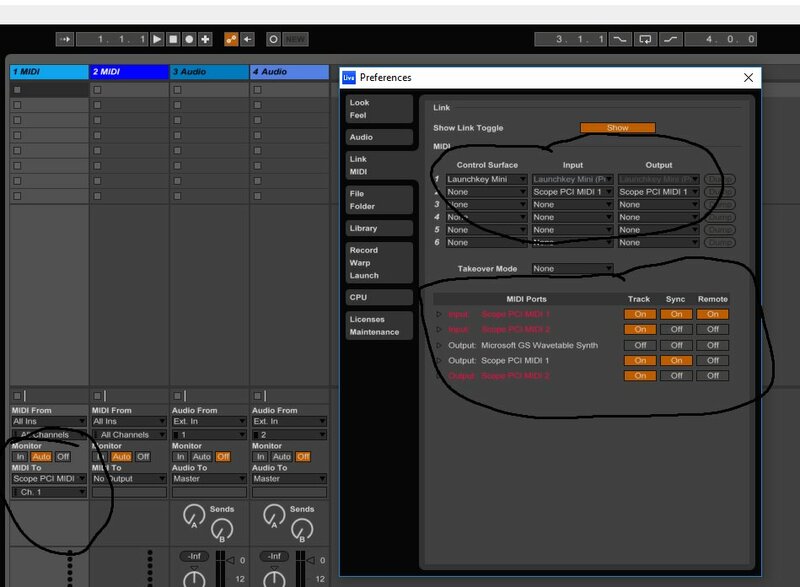 are you running Ableton in Win8 compatibility mode? Ok, I resolved it by reinstalling the drivers again and SCOPE Midi became visible in Ableton! Now I have both audio and midi working. Very nice. But I now have a new problem. All other audio stopped working. Both internal and external usb soundcard produce no sound and I have an error icon in the tray. select the driver you want to work for Windows sounds, and then the x on the "speaker" icon will go away. why do you need so many interfaces? you can only use one ASIO driver at a time. MME(wave) drivers are more flexible, but they're not good for making music. The two other sound cards are the integrated motherboard one and an external roland quad capture usb. I'll need the micro phone inputs to record sounds for games every now and then so I have to keep it. The way the Pulsar cards are added doesn't allow me to use the extension cable but only the adat input/output. I have both cards added with a pcie adapter and the added height makes the cable port just out of reach. that might make a mess. those don't work, but if you don't do anything too intensive, it should work well enough. Well, honestly I don't expect it to work at all, let alone running two cards combined. So far I've had the DSPs running at over 50% without problems but I'll try to push it a bit further to see the limits. In any case I just wanted to get a look at the state of the software before eventually buying an xite. this is something that people often don't understand. the dsp usage has nothing to do with the PCI usage. this means that communications with the host computer are what will be affected. ASIO channels, delays and reverbs will be the stressors since those require communication with Windows. in any case, it may be just fine for you, i'm just giving my warning, i can't help it.